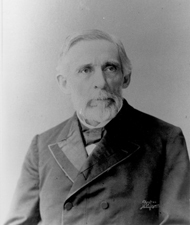 BOUTWELL, George Sewel, a Representative and a Senator from Massachusetts; born in Brookline, Mass., January 28, 1818; attended the public schools; taught school in Shirley, Mass. ; engaged in mercantile pursuits in Groton, Mass., 1841; appointed postmaster of Groton 1841; studied law; member, State house of representatives 1842-1844, 1847-1850; unsuccessful Democratic candidate for election to both Congress and the governorship on several occasions between 1844 and 1850; State bank commissioner 1849-1851; Governor of Massachusetts 1851-1852; member of the State constitutional convention in 1853; secretary of the State board of education 1855-1861; member of the board of overseers of Harvard University 1850-1860; member of the peace convention of 1861 held in Washington, D.C., in an effort to devise means to prevent the impending war; served on the military commission under the War Department in 1862; first Commissioner of Internal Revenue in 1862 and 1863; elected as a Republican to the Thirty-eighth and to the three succeeding Congresses and served from March 4, 1863, to March 12, 1869, when he resigned; one of the managers appointed by the House of Representatives in 1868 to conduct the impeachment proceedings against President Andrew Johnson; appointed Secretary of the Treasury by President Ulysses Grant 1869-1873, when he resigned; elected as a Republican to the United States Senate to fill the vacancy caused by the resignation of Henry Wilson and served from March 17, 1873, until March 3, 1877; chairman, Committee on the Revision of the Laws of the United States (Forty-fourth Congress); appointed by President Rutherford Hayes as commissioner to codify and edit the Statutes at Large in 1877; United States counsel before the French and American Claims Commission 1880; declined appointment as Secretary of the Treasury in 1884; practiced law in Washington, D.C.; counsel for Haiti in 1885, for Hawaii in 1886, and for Chile in 1893 and 1894; president of the Anti-Imperialist League 1898-1905; died in Groton, Middlesex County, Mass., February 27, 1905; interment in Groton Cemetery. American National Biography; Dictionary of American Biography; Boutwell, George S. Reminiscences of Sixty Years in Public Affairs. 1902. Reprint. New York: Greenwood Press, 1968; Brown, Thomas M. George Sewall Boutwell, Human Rights Advocate. Groton, MA: Groton Historical Society, 1989.